Friday, November 14 at 10:30pm. Tickets $5 at the door. “Silence” gives comedians the opportunity to get real with audiences without the bounds of the setup and punchline expectations of the comedy stage. 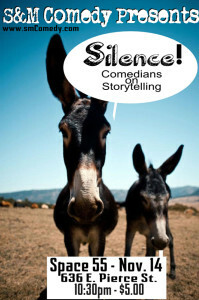 For a comedian to tell true stories from their real life requires the performer to fearlessly explore the depths of their darkest moments, skillfully craft a story, and steadfastly charge ahead onstage in the face of that most dreaded adversary -silence.